The SetupBuilder Run Installer Action allows you to run an installer executable that has been compiled by SetupBuilder. On the SetupBuilder Installer tab specify the path to the Installer Executable. If the executable is not an installer package generated by SetupBuilder then the action will fail. 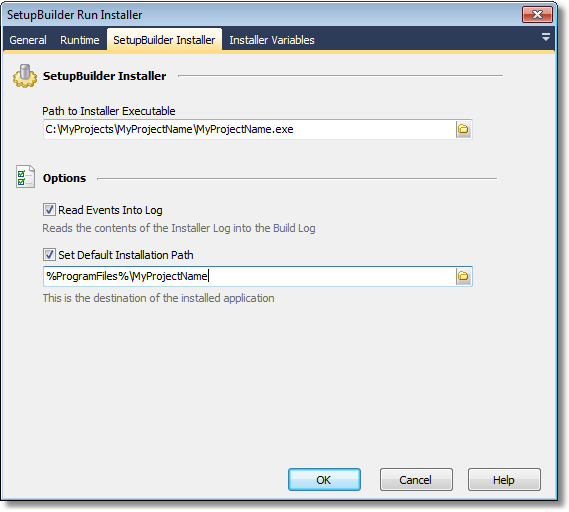 • Read Events Into Log - At the completion of execution read the contents of the Installer Log into the FinalBuilder Build Log. • Set Default Installation Path - The SetupBuilder will contain a default install path (which is the destination for the installation). This option lets you override this value so you can specify a custom location for the application to be installed. 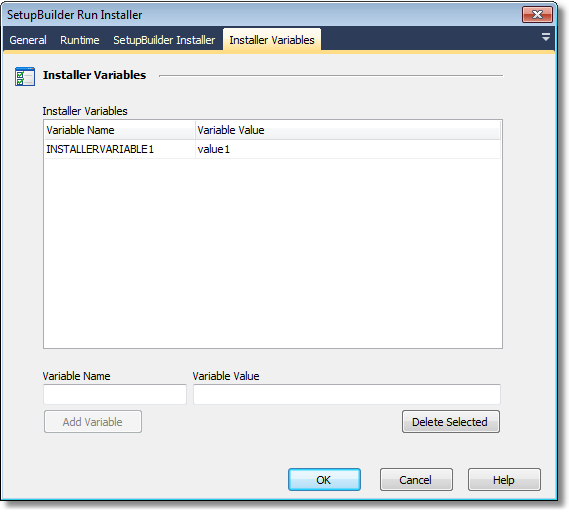 The SetupBuilder Run Installer Action also allows you to define Installer Variables via the Installer Variables tab. Enter a name and a value for the Installer Variable in the text boxes provided (once both text boxes are populated the Add Variable button will be enabled) then click the Add Variable button to add the variable to the list. Once added to the list you can modify the value of the variable by selecting the value in the grid view and typing a new value. The variable name cannot be modified once added, to change a variable name you must delete that entry and add the name/value pair again. Note: An equals sign (=) will not be accepted within a variable name. If you want to define a name that contains an equals sign you can create a FinalBuilder project variable (which contains the desired name) and pass this variable as the variable name. All variable names are added in uppercase. Note: This action runs in silent mode, which means the installer dialogs will be suppressed and default values will be used. Any values that you want to populate can be passed via an Installer Variable or by using an INI file to define values. This action requires SetupBuilder Developer Edition. For more information about SetupBuilder see the Lindersoft website.